On Sunday 11th June Star Eventz UK attended Oscar’s Wedding Fair by Perfect Wedding events at Oscars events venue in Calverton in Nottinghamshire. Oscars is a newly refurbished venue in Calverton, Nottinghamshire, only 10 minutes from Nottingham city centre with close proximity to surrounding areas of Woodborough, Lowdham and Mapperley. On arrival we were taken back by the clean design and fresh contemporary surroundings of Oscars venue and were very excited to get started and get the mirror running and taking photos. Not only was the new venue looking fantastic but there was a beautiful garden surrounding the venue too which seemed very popular with the guests. 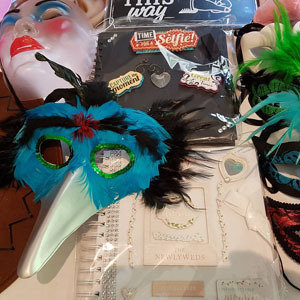 Once we had set up our Magic Selfie Mirror we lay out some of our favourite props, got the red carpet and barriers ready, lay out a guest book example for guests to look at and we were set. Brides-to-be with their mums, sisters, bridesmaids and partners started arriving and we knew it would be a fun filled day with the Magic Mirror and the guests. It was interesting to see how many people were taken back at what the Magic Mirror actually does and the difference there is between this and the traditional photo booths. Many were very impressed with it’s elegant design and how little space it took up once assembled. It was a rather busy day with many brides-to-be enjoying browsing the stalls and coming over to try out the Star Eventz UK Magic Mirror and taking their photos. 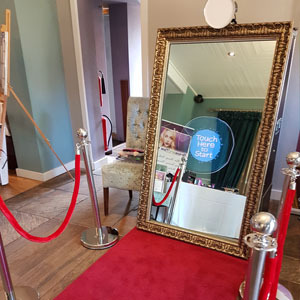 We let everyone take a photograph home with them as a reminder of their day at Oscars Wedding Fair, we even made our own Magic Mirror template especially for the day! We had a great day and very much enjoyed watching everyone having fun with the mirror and taking photos, many posing in the props and getting some great shots to remember their day. The staff at Oscars Wedding Fair were very helpful and polite and nothing was too much trouble for them to do, so thanks to everyone involved! We showcased the Mirrors features such as bespoke photo frames and designs, signing features, fun props. We had a great amount of interest and it was quite a showstopper at the event. 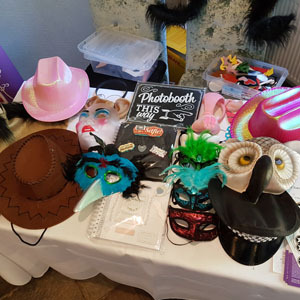 Not only did we have lots of fun it was a great chance to showcase the Magic Selfie Booth’s features such as the bespoke designed photo templates/frames, photo-signing features, great props and more. We also had lots of interest and it was quite a show-stopper at the wedding fair, 2 bookings were made on the day, so all in all it was a very successful wedding fair for us and we are looking forward to the two weddings we will be attending with the mirror. We also spoke to some great wedding vendors, shout out to Linsey Hardy, a wedding vocalist who was extremely busy from the start with her smooth melodic voice. Kirsty York who was showcasing unique beauty products and Urban Design Cosmetics who was has some great products on offer and was very knowledgeable, she was very inspirational indeed. We would thoroughly recommend Oscars as a party venue whether it’s your wedding, anniversary or Christmas party it has great facilities, surroundings and polite and helpful staff. We really enjoyed ourselves at this event and look forward to showing off the Magic Selfie Mirror at another planned event there soon very soon.